and I am so pleased to be able to share this with you. 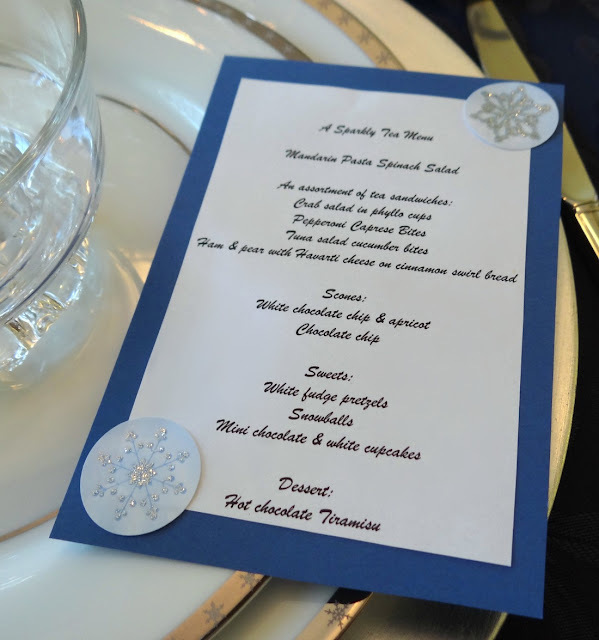 with the most perfect winter's theme and attention to detail! the pictures to do most of the the talking. 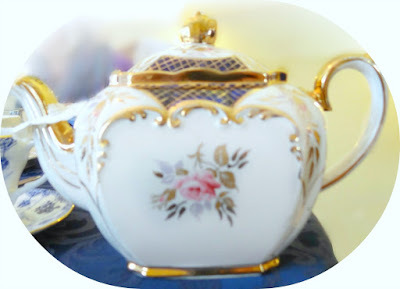 Here was the gorgeous teacup I used. I loved her blue and white and shiny tablescape! 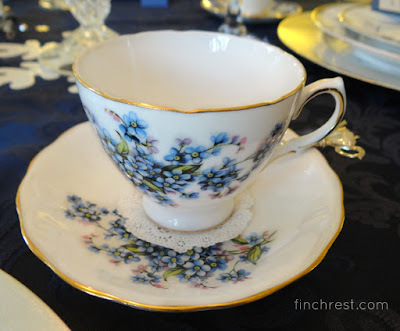 Her china cabinets are filled to bursting with exquisite tea items! Oh, my, the food was so pretty and sooooooooooo delicious! in her gorgeous heavy leaded crystal goblet. to yummy frosty white pretzel bites? seemed to fit in rather well with the tea colors. my Sandy's Tea Society Ladies. Dawn, Karen, Pam, Mary, Auntie Pam, and Marina. I absolutely adore these gals. They are so loving, polite, giving, kind, thoughtful and sweet. My time with them is never enough. I miss them even on my way home from my visits. They are truly beautiful both inside and out. 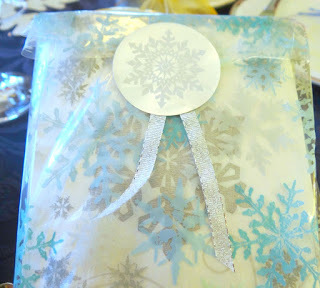 was our thoughtful favor from our lovely hostess, Marina! Thank you, sweet friend, for a most delightful tea party! As always, thank you, too for your visit today! OH Michele...I am sitting here with my jaw dropped in awe of the beauty of Marina's tea party, such grace and beauty displayed from her heart. You are blessed to have such lovely ladies in your life. January is certainly a wonderful time for a tea party and her "Sparkling Tea" was quite fitting for a month that can be drab. I so enjoyed my visit here this morning! What a beautiful table that she went to a lot of table making beautiful for all you ladies. I love the cup and saucer you got to use. What a special group of lovely ladies you belong to, Michele. Your Tea Society friends are the best. I certainly enjoyed seeing the lovely table at Marina's house. 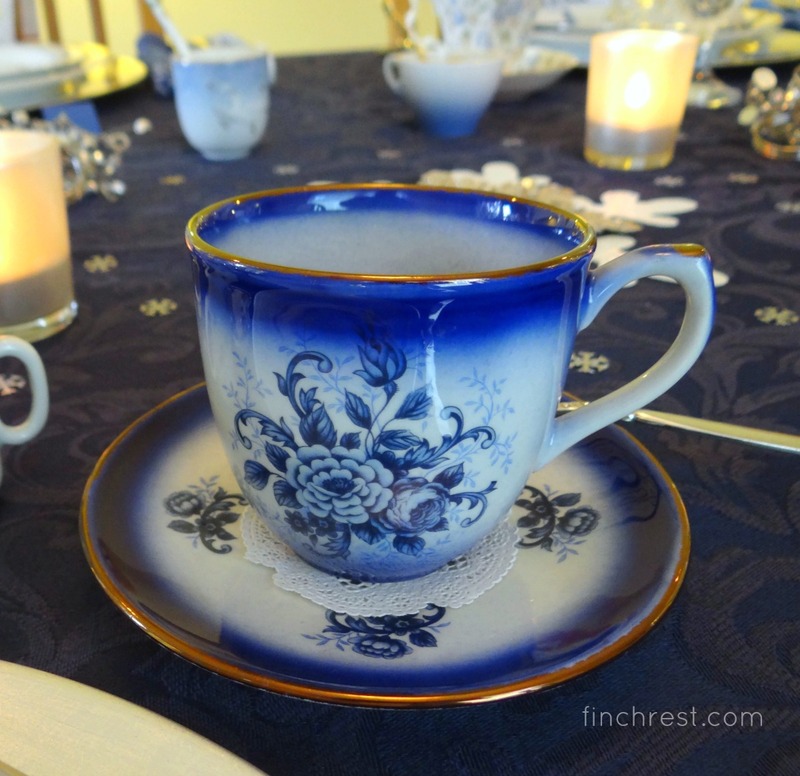 She sure knows how to throw a fabulous tea party, and the blue theme is perfect for January. Thanks for sharing the joy with us. You are all so beautiful and so is your tea party! Oh, I bet the cameras were clicking! Everything is lovely! 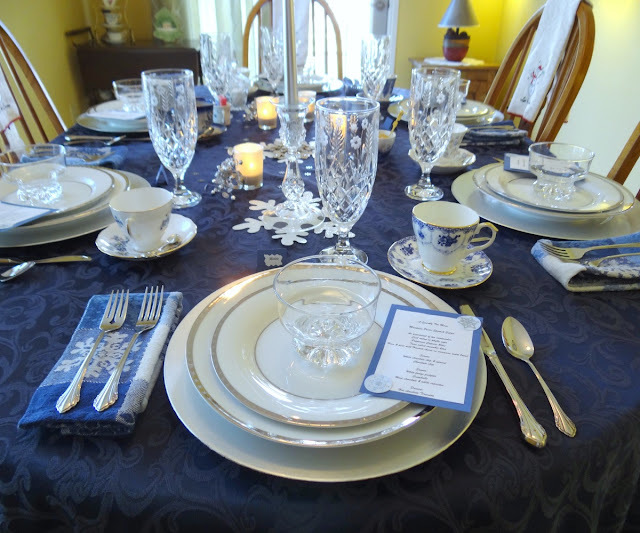 Oh,Oh,Oh, that is a beautiful table setting. 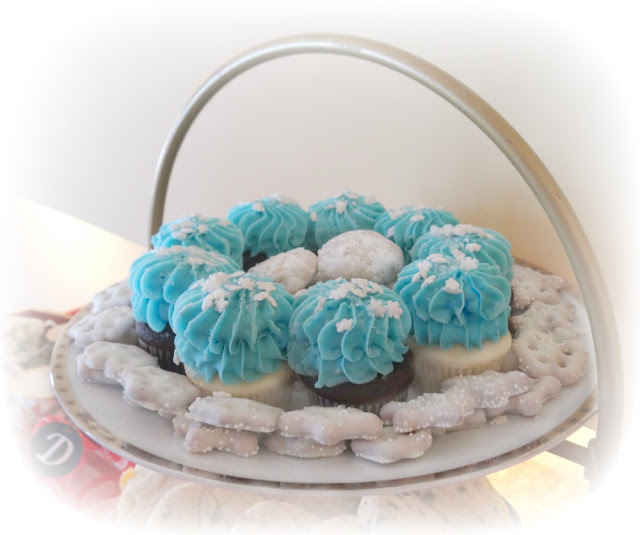 How nice everything looks, your friend is a very talented hostess!! Oh my, Michele, that table is just adorable. 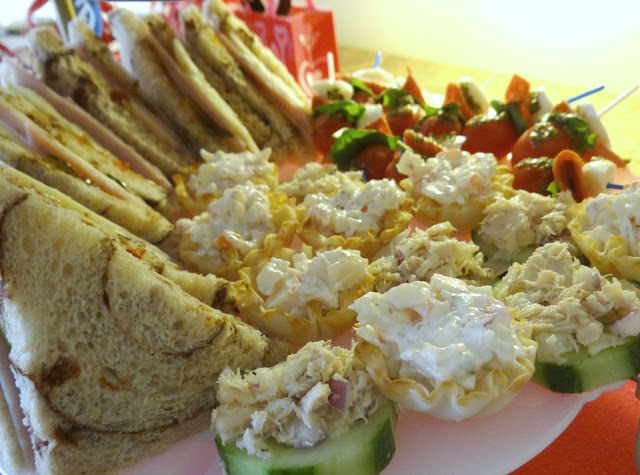 I know you always have a great time when one of the STS ladies (and you) have a Tea Party. Michele, what a beautiful table (and everything else)! 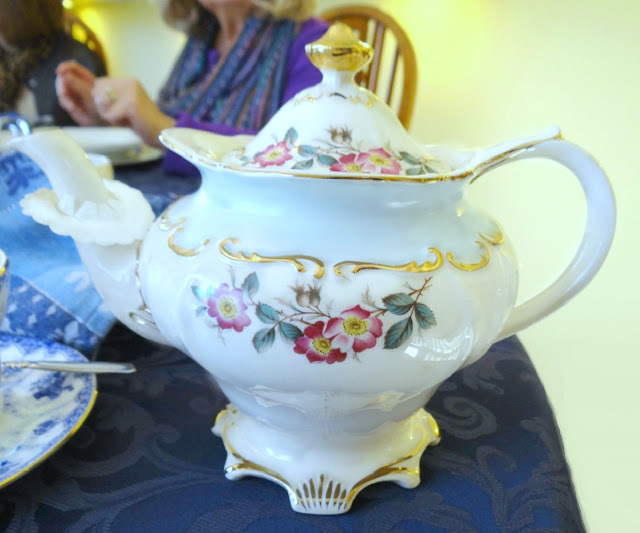 Nothing more relaxing and rejuvenating than a beautiful tea with dear friends. Everything about this tea party looks exquisite. You all must have had such a lovely time together. I'm singing the blues over your wonderful tea party! What was the aqua "welcome to tea" beverage? 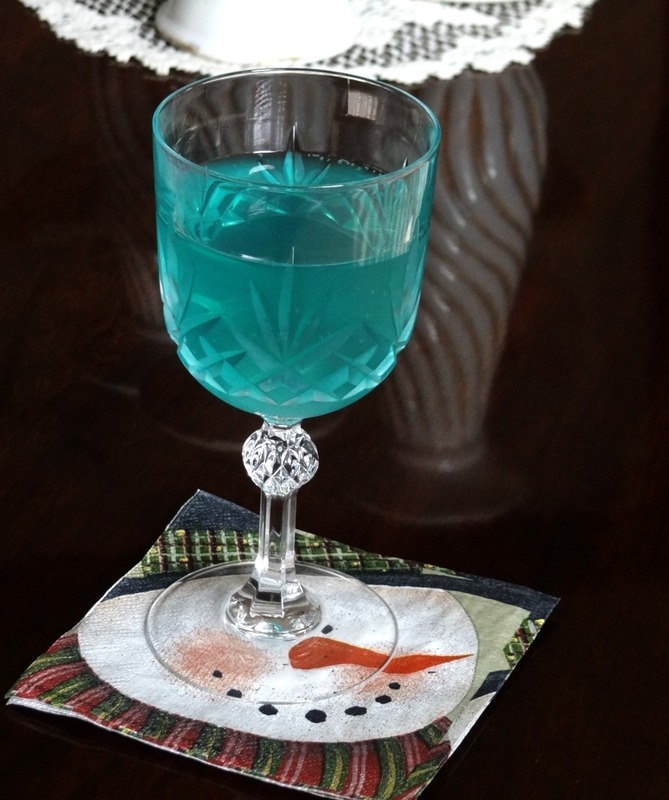 It was a sparkling blueberry fizzie, Margie. It was so good! BEAUTIFUL!!! So nice to have friends to share occasions with. Beautiful tea party with sweet friends. It does not get any better than that. 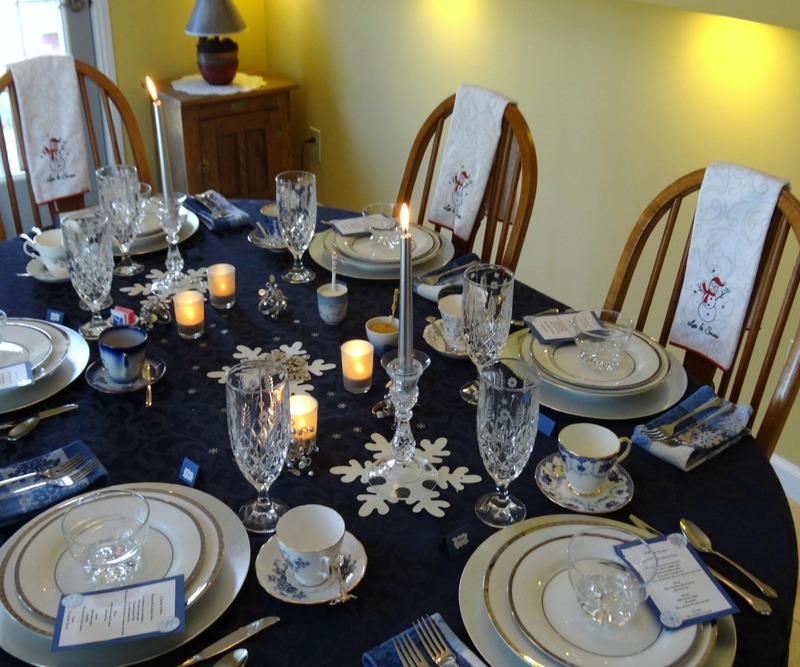 Your friends tablescape was beautiful and the food looked so yummy. Glad you had a great time. Oh so pretty! You ladies know how to chase off some winter blues. 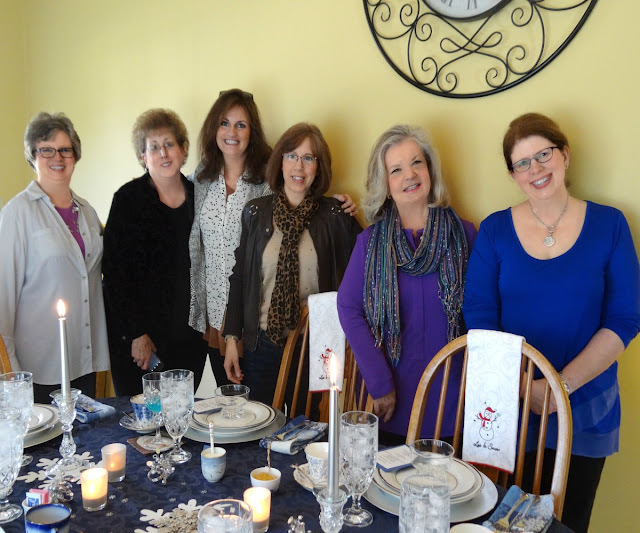 What a beautiful tea party from tablescape to delicious food! A perfect way to spend a wintry afternoon! Oh what a fun time for your tea friends. 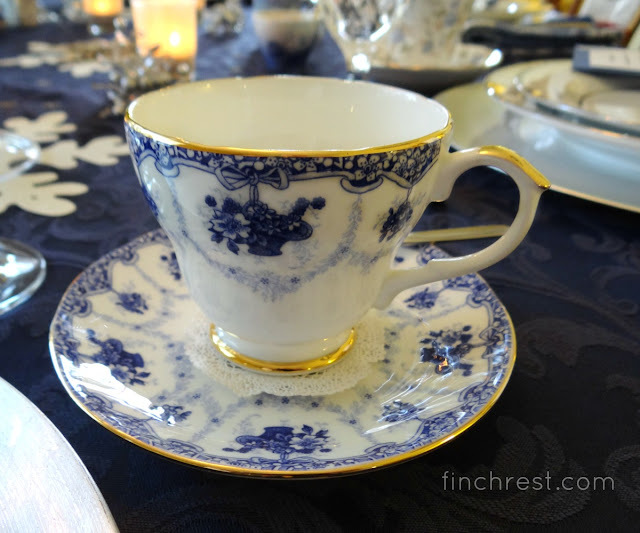 Love the blue and white tea cups. Thanks for sharing your fun day. Wow how lucky you are to have a group to socialize with like this. Love the table and all the different china pieces. She does have some lovely pieces. Oh, I'm glad you showed all these photos Michele - I felt like I was there looking over your shoulder. Of course I didn't get to try any of the scrumptious food but it all looked so nicely arranged and the towel gifts were sweet. You have an awesome group of ladies in your tea society. Oh Michele, what an amazing tea. The tablescape is stunning, so much beauty. Food looks yummy and the the cups WOW. Thanks for sharing this wonderful occasion and it looks like you all had a wonderful time. Michele, your friend Marina's tea is just a delight! The table is so pretty and the food looks marvellous. A feast for the eyes and the tummy. 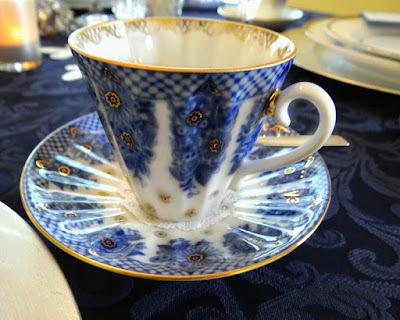 You're right, my blue and gold teacup would look splendid on that table. You do have some wonderful tea friends. Thank you for inviting me back to have a peek. Happy February, my friend! Everything looked so pretty! Your friend did an excellent job. I think it's great that you have all these lovely friends to have a tea party with. Michele, What a wonderful, wonderful tea party. I am so glad that you were able to attend. The decor is just so lovely -lots of attention to detail and I love the bonus of the towels. What a lovely way to spend an afternoon ~good friends,good food and a lovely table! Wonderful ladies sharing such a special Tea Time together. I can imagine it was the perfect day for all of you. The table setting and all the attention to the decor is so beautiful. What a lovely table that you are sharing and I see you all had a wonderful meal too. The food looks delicious. Your little packages look so sweet. 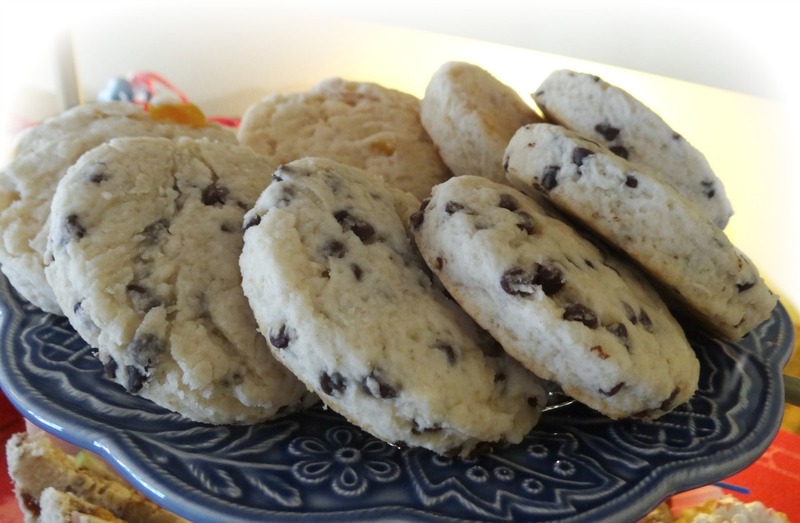 Thanks for sharing your posting! A beautiful blue table and I love the tea cups. I have one of them. All the foods looks so delicious. The tea towels on the chair backs are such a great idea. It's so wonderful to have great friends. What a lovely tea party! Such a love for detail, beautiful setting and what looks like very yummy food. I can understand that you like your sweet group of friends! What a wonderful tea! Everything was so beautiful! 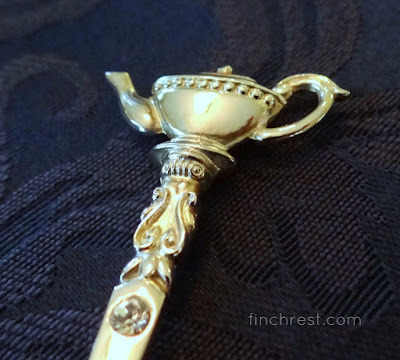 Your hostess has truly lovely tea things! Friends are the real treasures in life aren't they? Hi Michele, What a wonderful winter tea! 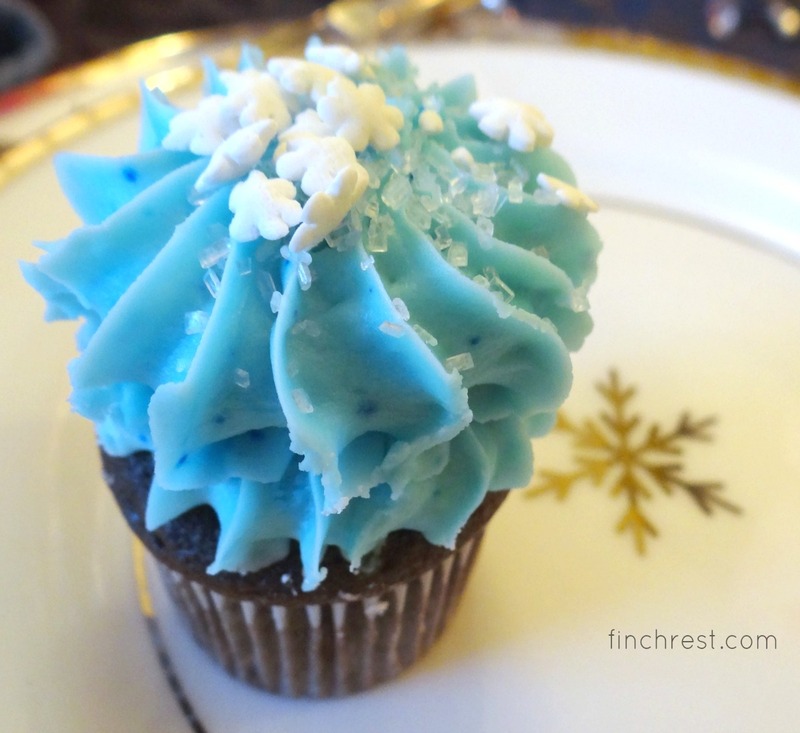 The menu is mouth-watering and I love those pretty blue teacups! I just love, love this tea party. 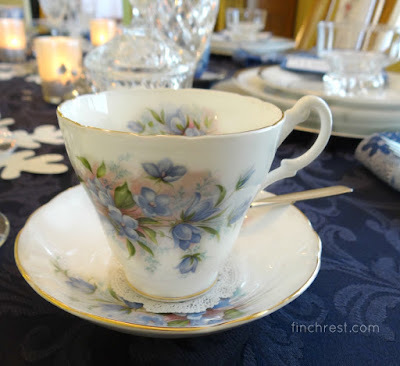 She did a beautiful job with the theme and setting up the table with those gorgeous tea cups. And the food.... AMAZING. Everything looks delicious. You are so lucky to have such wonderful friends. You have the best tea parties with your friends! The food looked yummy.